(CNN) — A jury on Monday convicted former Detroit Mayor Kwame Kilpatrick of most of the federal charges against him — including racketeering conspiracy, extortion and the filing of false tax returns — in a case that accused him of using the mayor’s office to enrich himself and associates, CNN affiliate WDIV-TV reported. Contractor Bobby Ferguson also was found guilty Monday of racketeering and extortion. Kilpatrick’s father, Bernard Kilpatrick, was found guilty of a single tax count, and not guilty on two others charges, according to WDIV. Kwame Kilpatrick, the Detroit mayor from 2002 until he resigned in 2008, was the biggest target of a years-long Detroit City Hall corruption probe that led to the convictions of two dozen people, including several of his closest friends and former City Councilwoman Monica Conyers, the wife of U.S. Rep. John Conyers. The former mayor was found guilty on 24 of 30 counts in federal court in Detroit. He could face up to 20 years in prison; sentencing did not take place Monday morning. Federal prosecutors alleged Kilpatrick ran a criminal enterprise through the mayor’s office to enrich himself through bid rigging and extortion, and using nonprofit funds for personal gain. The judge will hold a hearing Monday afternoon to decide if Kilpatrick can remain free until his sentencing. At the heart of the scheme was corruption in municipal contracting, mostly centering on the Detroit Water and Sewerage Department, said Barbara McQuade, U.S. attorney for the Eastern District of Michigan. Derrick Miller, a former Kilpatrick aide, entered into a plea agreement last year and is expected to testify against his former associates. In September 2008, the ex-mayor pleaded guilty to two felony counts of obstruction of justice stemming from his efforts to cover up an extramarital affair. He also pleaded no contest to charges of assaulting a police officer who was attempting to serve a subpoena on a Kilpatrick friend in that case. 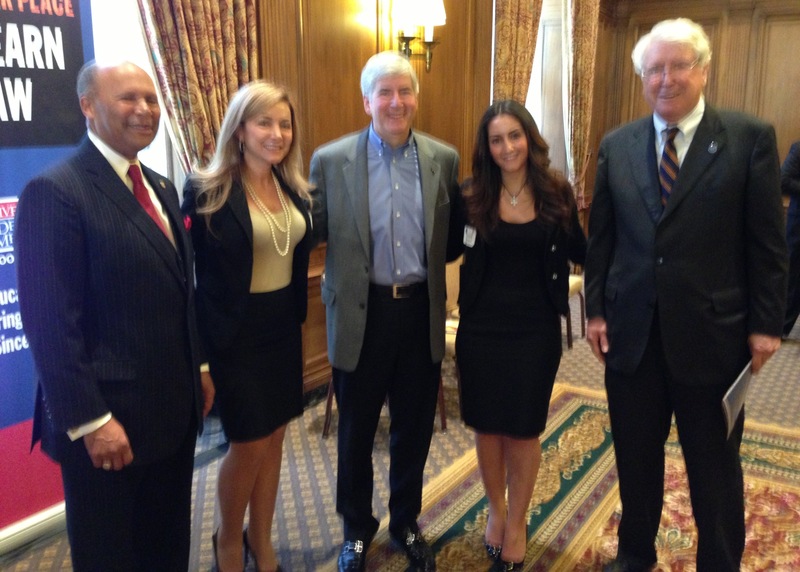 On Friday, March 8 , 2013 we were honored to attend University of Detroit Mercy’s Third Annual Symposium for Global Michigan: Immigration and Economic Growth. The Symposium targeted local approaches to immigration, high-skilled and low-skilled immigrants, federal immigration policy and local development and economic and human rights issues on the Canada-U.S. border. A few of the Symposium speakers included our very own Rick Snyder, Governor of the State of Michigan, Gary Peters, U.S. Representative of the 14th Congressional District of Michigan, Benjamin Johnson, Executive Director of American Immigration Council, and Lisa Atkins, Director of Immigration Policy from the U.S. Chamber of Commerce. 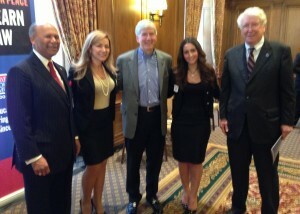 Honored to meet Governor Rick Snyder, Lloyed Sempel Dean of Law at University of Detroit Mercy, and Antoine Garibaldi President of University of Detroit Mercy.